Many countries, including nearly all of Europe, have discontinued fluoridation. And recently, in August of 2014, Israel outlawed fluoridation. The practice is allowed in many countries and the U.S., and about 70% of the U.S. residents currently receive fluoridated water. However, there's a long list of cities and communities have rejected fluoridation over the last decade or so. Because of the potential health effects, the U.S. Environmental Protection Agency has established national standards limiting the maximum allowable fluoride concentration in public water supplies. But even those standards have been questioned as perhaps been too lenient in a 2006 comprehensive study on fluoride by the National Research Council. Based on these and other concerns, the EPA recently announced, in April 2015, a proposed change in the recommended level for community water systems to 0.7 milligrams per liter (the low end of the prior recommended range of 0.7 to 1.2 milligrams per liter). Distillation, ion exchange and reverse osmosis water treatment systems are very effective at removing fluoride from water. However, their use may be overkill if your objective is to remove nearly all fluoride from your drinking water. There are several different types of water filter systems that can remove more than 90% of the fluoride from your water, and they’re less expensive and much less complicated to operate and maintain than the other forms of treatment. 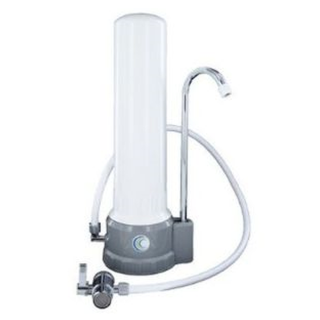 A filter element designed specifically to reduce fluoride (and chlorine, heavy metals and numerous organic chemicals), the Aquametix filter element, is capable of reducing fluoride levels in your drinking water by as much as 90%. The AquaMetix water filter element is designed to provide the highest quality drinking water possible from a single stage block filter. This very unique adsorbent will adsorb and/or exchange a variety of organic and inorganic substances, including most heavy metals, chlorine and nitrogen compounds including ammonia, urea and chloramines.This filter will reduce a wide variety of drinking water contaminants of both aesthetic and health concerns. The dense pore structure and vast surface area is ideally suited to improving taste and odor, color, chemicals, MTBE, and fluoride.